We left Box Hill just in time because, as we drove down the wooded valley, the rain appeared. We were heading east towards our hotel in Kent and as we reached the M25 the heavens literally opened. I cannot remember driving in such difficult conditions for many years and it just had to be whilst driving round one of the busiest motorways in Britain! There was a thick sheet of water constantly in front of the car and the spray from the other vehicles made it feel like Cobo coast road on a big high tide. It then started to hail and the glass of the sunroof sounded like it was to smash at any moment. I am surprised the steering wheel didn't deform I was gripping it so tightly. We decided that a stop at Clacket Lane Services was in order to grab a breather and some grub. Back on the motorway, the next wave of storm-clouds hit us and it was almost as bad as before. We eventually reached our Travelodge at the M2 Medway services at around 10-ish and literally had to wade through the flooded car park to get inside. Of course, most sane people would have decided that, after a busy day, it was probably time to have a beer and go to sleep. However, we were not at this location by accident. We needed to head out again into the soggy Kentish night. We were about to embark on a 'Pan-listing' pilgrimage. A rite of passage for all multi-taxon listers. We were off to search for Scorpions! We drove the short drive across the giant bridge that leads to the Isle of Sheppey in the mouth of the Thames Estuary. Stuffed into the corner of this island is the port of Sheerness and the scorpions can be found in and around the old dockyards. Apparently they have been there for a couple of hundred years, first arriving with Italian masonry shipments from the Med. There have been sightings at a couple of other locations in southern England but this is the only properly established colony in the UK with thousands of individuals and so this is a famous pan-listing spot. Although many of the scorpions will be in the docks themselves, there is an old wall where everyone goes to see them, which is where we were heading. It was now at least half-eleven and we were a little concerned that the wet weather and not-so-hot temperatures might make them difficult to find. Of course, other reasons that they might be difficult to find is that they are small, hide a lot and it was dark! Thankfully, as well as my normal torch, Andy had borrowed a special UV torch since scorpions are supposed to glow under UV waves. We wandered along the wall and looked for any bright spot that the torch might pick up. After a couple of false alarms with bits of fluff or bird poo, we were coming up blank until Andy shouted me to have a look at something. Unlike the slightly whitish-bluish colour of the false alarms, the torch had picked up a little blob of something that was beaming and bright blue and like a tiny neon light stuck into the brickwork. Although it didn't look like anything at first, closer inspection revealed it was indeed, a tiny, few cm long Yellow-tailed Scorpion - Success! I took the torch so I could find one myself and further down the wall I managed to spotlight a larger one right out in the open. It quickly scurried between two bricks. Like the last one, it was difficult to take photos as they were both a little too high on the wall to make it easy and also because it was dark, most of the time it was just point and shoot in the right direction. As this was about twice the size of the first one we could see it better and even the sting. I don't think scientists are too sure why the scorpions are so fluorescent but its weird if its just an accident. The pics below give some idea of the size as it is walking between two bricks in the wall, where the mortar has worn away. We looked for a little while longer and found two more scorpions which were much bigger than the ones we had seen. Unfortunately these were both tucked right behind bricks and all you could see was the claws sticking out and the top of the head. Relieved with our success on such a damp night we crawled our way back to the Travelodge as it was now well past midnight. The next morning we didn't exactly get up at the crack of dawn but we knew we had to make the most of the first few hours because another rain band was moving up from the south. As we had been too late for the Silver-spotted Skippers at Box Hill yesterday, we thought that there may be another site for them somewhere near us in Kent as we were still on the line of the North Downs. A bit of googling later and we were very surprised to see that there was a SSS site less than a mile from where we were sitting! Queendown Warren was a nature reserve just down the back lane from the services and we were there in just a few minutes. Just as we emerged from the car, the sun broke through the clouds and we enjoyed bright sunshine. As soon as we went through the gate we could see that there were some excellent wild flower meadows dominated by Marjoram, and even though it was quite early in the morning, the butterflies had started to take flight. It didn't take us too long to see some skippers skipping across the flower tops, and we quickly picked out some Silver-spotted Skippers, which seemed to be in the majority. This was a new species for both of us. There were so many other insects here, including many Common Blue and Brown Argus butterflies, Rufous Grasshopper, Short-winged Conehead (both new species for me) and many types of diptera and hymenoptera. Further along the path, the trees opened out to south-facing, short-turfed downland and there was a sudden change in butterfly species with both Adonis Blue and Chalkhill Blue flying commonly low over the slopes. I had seen Adonis once before, over 20 years ago but Chalkhill was a new species for me. You think a Common Blue is pretty bright until you see Adonis shouting its blueness at you, and I really liked the subtle Chalkhills which flew around like Common Blues that had been dipped in milk. Other new species for me in the vicinity were the pyralid moth Sitochroa verticalis, the high-pitched Roesel's Bush-cricket crawling a stem, Quaking Grass and Burnet Saxifrage. Heading back into the sheltered meadows and trees, the temperatures had warmed up and there were thousands of insects buzzing about - wonderful stuff. In amongst these - thanks to Andy's identifications - I had 3 new flies, a new bug, a new sawfly, and a new dragonfly, with 2 or 3 Southern Hawkers hunting in the lee of the bushes. We could have stayed at Queendown for a much longer time but we were aware of the impending rain and thought we'd better try and cross the Thames and try for a few things in Essex. The queue for the Dartford tunnel was very annoying and as we headed East into Essex the rain had caught us up. Our main target here was on Canvey Island where one of the ditches had hosted lots of Southern Migrant Hawkers all summer. We made the most of a dry spell and hopped over the stile towards the ditch. Very quickly we saw a hawker dragonfly and it seemed to have blue spots and blue eyes and we convinced ourselves that this might well be one. 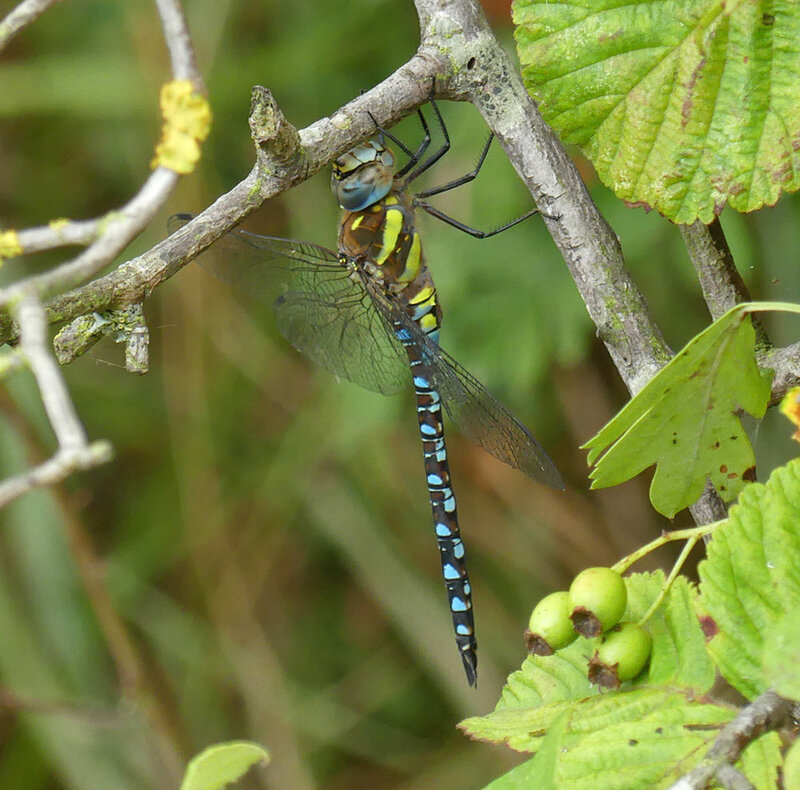 However, when the rain started again and we looked at the photos in the car it was only a normal Migrant Hawker - gutted! We then drove off to find some breakfast but another break in the rain suddenly appeared which prompted us to U-turn and give it another go. We walked much further down the ditch and we did see lots more Migrant Hawkers, but none of them could be turned into Southerns. Perhaps we'd arrived a little late at this site and the species had 'gone over' here, but its something to go for next time I guess. Another species which was common here was Ruddy Darter, a dragonfly we do not get in Guernsey. It then started raining yet again and, looking out to the south and west, it did not at all look like it was going to break. So we cut our losses and went for an excellent fried breakfast in Benfleet, at a café run by the most Essex old man you're likely to meet. We slowly made our way north towards Norwich but even a quick drinks stop at Beacon Hill Services near Ipswich gave me two plant ticks - Grass-leaved Orache and Wild Liquorice. It was a shame the weather put paid to us cleaning up in the heaths and downs of the south, but with at least 50 ticks for me in less than two days, I had to be pleased.